1941, Manhattan bustles, and New York City's newest subway line - the "A" train - is moving people in more ways than one. A new instrumental "Take the 'A' Train," rolls up the charts and will become the signature song of pianist Edward Kennedy Ellington. The song will bring financial success to a pioneering music publishing venture, owned by Duke Ellington. But was the young composer of "Take the A Train" himself denied full credit for the hit song? More than half a century later, Garfield Gillings, of Brooklyn, New York, has made a discovery, boxes of sheet music in a dumpster. 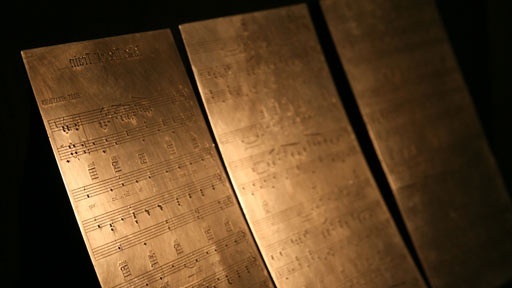 Among the paper scores are metal sheets that look like printing plates for "Take the A Train." History Detectives sets out to find the story behind these plates and to determine the role they played in this jazz classic. Related Investigation Lauste Film Clip How is this odd strip of film connected to the invention of talking movies? Also in Depression and WWII: 1929-1945 Texas POW Camp Was this small town in Texas the home of a WWII POW camp? Also in Depression and WWII: 1929-1945 WWII Landing Craft Did this vessel land tanks on the beaches of France during World War II? Also in Season 8 Spybook What does this little black book reveal about spying on the home front during World War I?